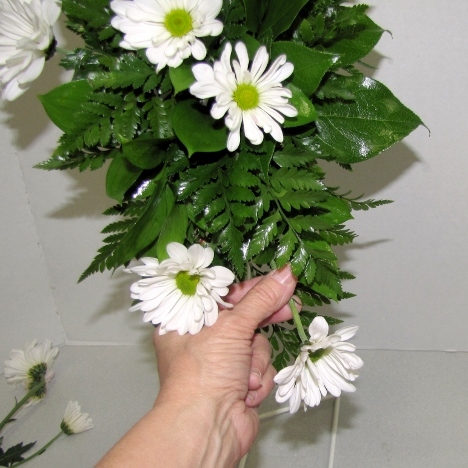 These white daisies can make a lovely cascading bridal bouquet. 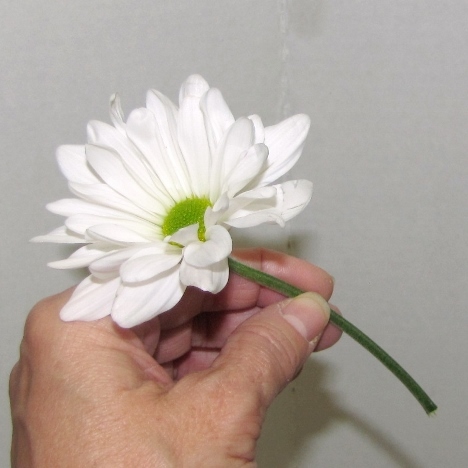 When designing with daisies, I like working with the natural curve of the flower - using it to my advantage in the designs I create. 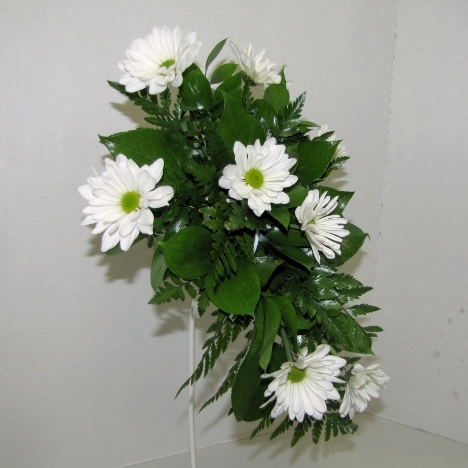 I'm going to be framing the outer perimeter of the bridal bouquet. 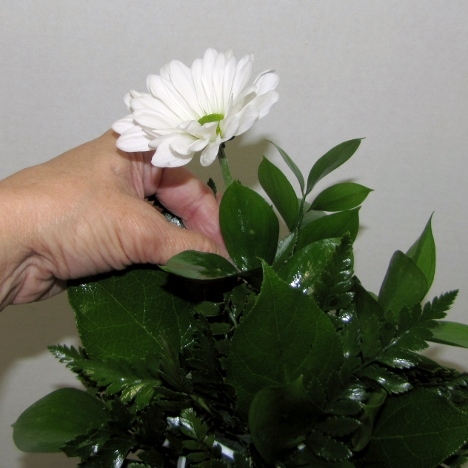 This means these flowers will determine the final height and width of the bouquet. Leave a little longer stems, but insert only about an inch or so into the foam. 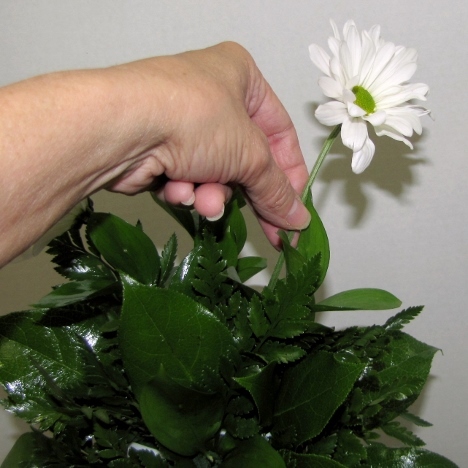 It doesn't have to be deeply buried or the stems will start hitting each other. 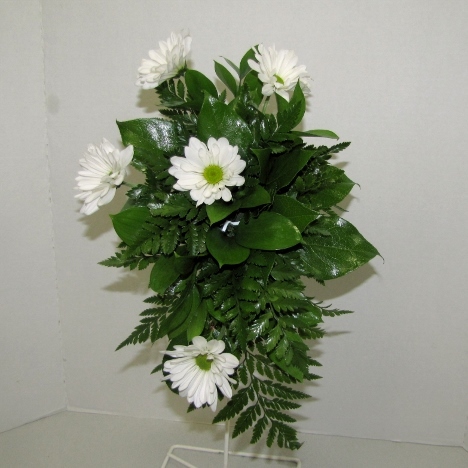 The flower heads should peek out just a little beyond the edge of the greenery tips. 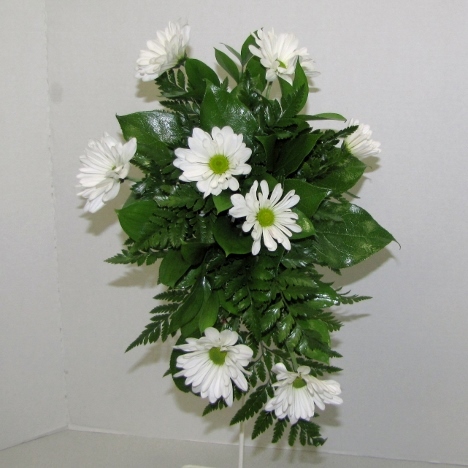 See how I'm facing the curves of the daisies outward, taking advantaging of the flower's natural direction to face my flower heads in the right way. 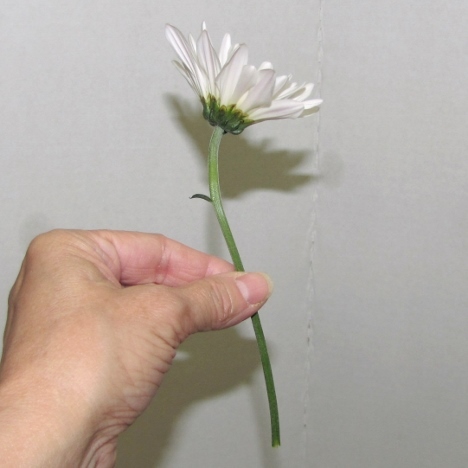 You can see more what I mean by looking at a side view of the daisy. 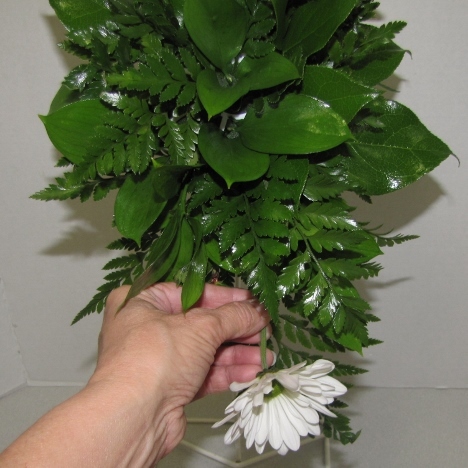 I'm using the longer stem to outline the length of my cascade, facing my flower head turned slightly to the right. I now cut another stem just slightly shorter than the first. It will go into the left side of my design, with the flower facing openly to the left. 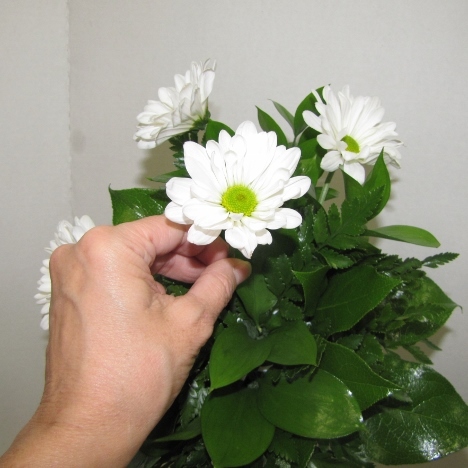 I'm placing another daisy directly in the middle, facing straight out from the bouquet. You can see how the size of my bouquet is quickly taking shape, with all of the flower heads except the middle one facing outward. I now take a stem, just a little longer than the stems on the sides, and insert it under the middle flower head, down on it's right side. Again, note that I faced that flower slightly facing to the right. 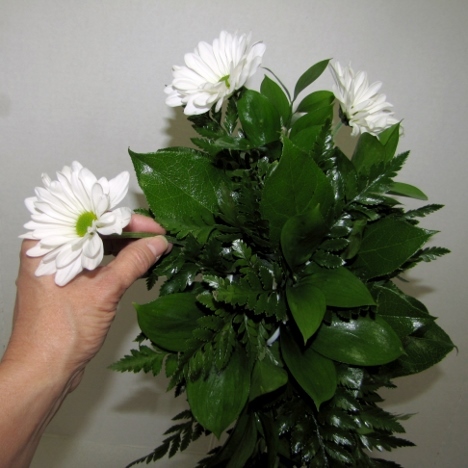 I start filling in the cascade, pushing the stem upward into the foam frm the bottom of the bouquet. I continue to add more blooms on the outer sides, taking care to mix different sizes of flower heads. The size of the bouquet is quite apparent by now. 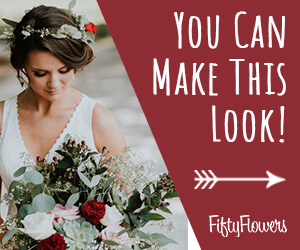 Take the bouquet and hold it, looking into a full length mirror. 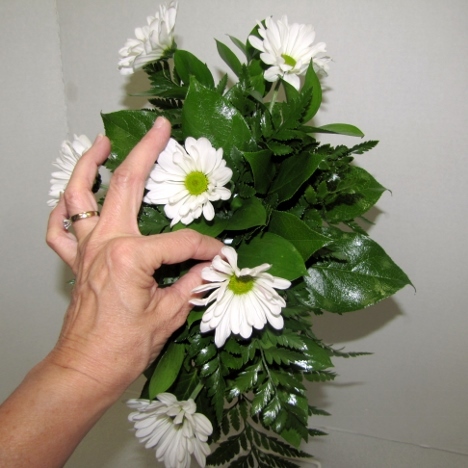 This will let you know if you need to lengthen the outer stems to make the bouquet bigger. 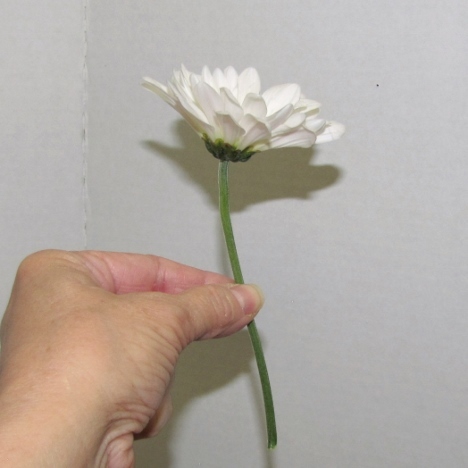 Full flower heads should be seen from all angles. 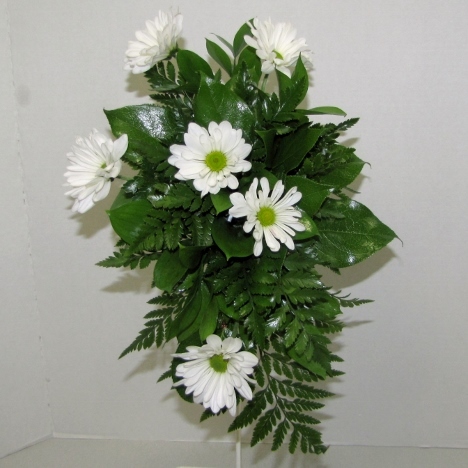 Remember - the guests are going to see the bouquet from the side as the bride enters the church. 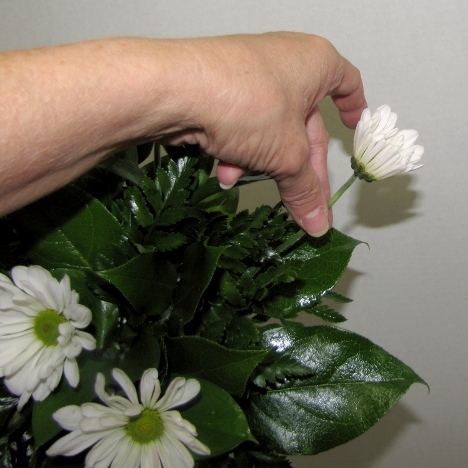 Make sure the flowers are beautiful from all angles.